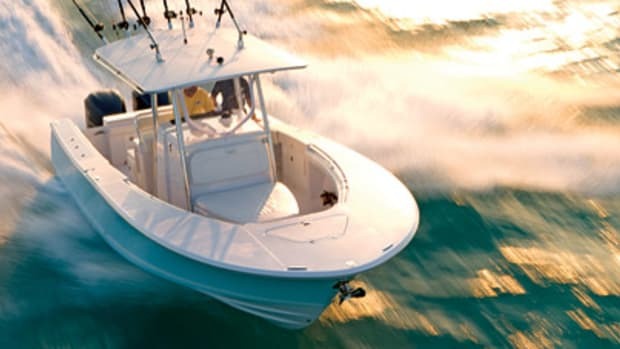 There’s a reason Boston Whaler is one of the oldest and most successful boat brands, and there’s a reason it builds 15 center console models from 15 to 37 feet. They work. The center console has appealed to anglers for decades with its simple, no-frills open layout, ease of upkeep and ability to run through rough water. But the center console has taken on a few extra tasks since the 1980s, when it served mainly as a vehicle for fishing. Builders have capitalized on the versatility of the design, which allows them to mold and shape the boat to satisfy the wide range of needs for today’s boater. The center console has grown into the ultimate all-around family-and-friends boat, defined by lots of seating (padded), storage, and conveniences such as freshwater showers, heads, and even air conditioning and flat-screen TVs. Even the fishing equipment has evolved — for example, a power-operated fishbox and console doors. Customers want to see more amenities — and not just for offshore fishing but also for family fishing and other types of family activities, Kopp says. “The art becomes staying true to that core mission, and yet providing the additional amenities in a sensible way that adds value for the customer,” he says. 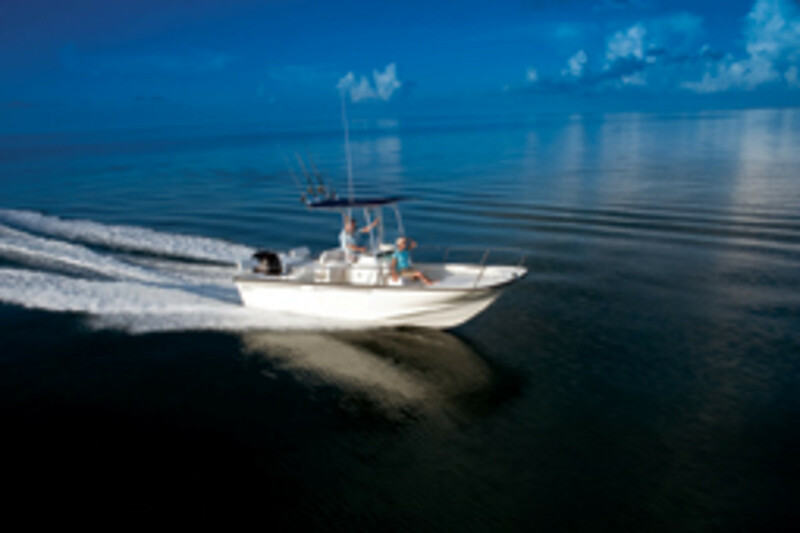 Even in a 20-footer, a center console’s open layout allows three or even four anglers to fish simultaneously. Usually, the console is farther aft than on other boats, such as walkarounds and dual consoles, so the helmsman and companion experience less pounding. 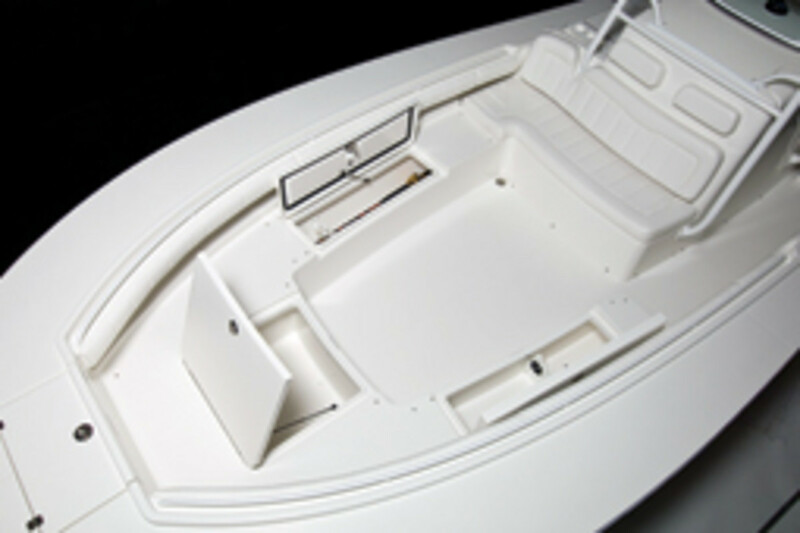 Another key element in today’s center console is the builder’s ability to squeeze out two or more uses from various deck components, such as the foldaway transom seat. It’s usually a two-person settee that pivots into a recessed area in the Euro transom. The first transom seats were uncomfortable and hard to adjust and fold away, but builders have improved their designs dramatically in the last few years. Electronics are flush-mounted on the console, which also can be topped with a windscreen. A T-top is not essential, but it protects the crew or family from the elements and provides an out-of-the-way place for mounting rod holders, outriggers and antennas. Insulated fishboxes and live wells round out the other essential equipment. 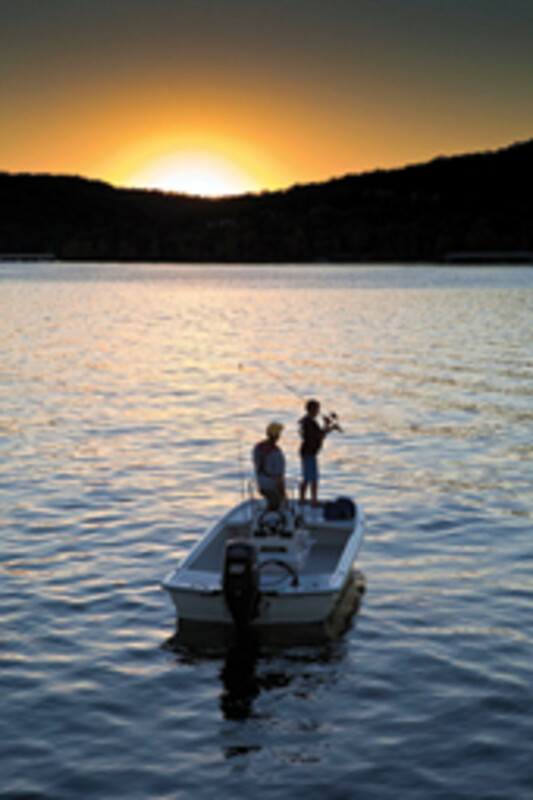 Advances in outboard engine technology — higher horsepower and fly-by-wire controls — as well as helm control and steering systems during the last 15 years allow builders to construct larger, easier-to-operate boats. Center consoles exceeding 40 feet are no longer uncommon. And now we’re seeing joystick helm control in the center console world. 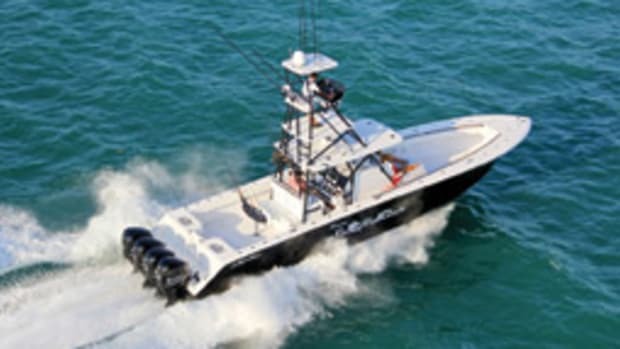 SeaVee and ZF Marine started it all with its single-pod 34-footer. Seven Marine introduced a 557-hp outboard with ZF’s Joystick Maneuvering System — the first outboard-powered boat with a joystick. And at this year’s Miami International Boat Show, Teleflex Marine introduced a joystick and power-steering system that can be linked to mechanically operated outboards — a big development for the repowering market. Apart from the Seven Marine outboard, the horsepower push has slowed somewhat in the last three years. Builders such as Yamaha and Suzuki have been busy upgrading their engines. Yamaha now has a fleet of second-generation big outboards, led by the V-6 F300. It also has added a 70-hp engine that weighs the equivalent of the carbureted 2-stroke 70 — a good fit for small center consoles, bay boats and skiffs. Suzuki’s DF300 now has the ability to change propeller rotation, another plus for repowering and buying and selling the engines down the road. Mercury in 2011 introduced its Gen II 150 FourStroke, which is touted as a super-durable, high-displacement workhorse. The continued advances in propulsion and technology in general have helped fuel the changes in the center console genre. We’ll illustrate those changes by taking a look at eight boats. 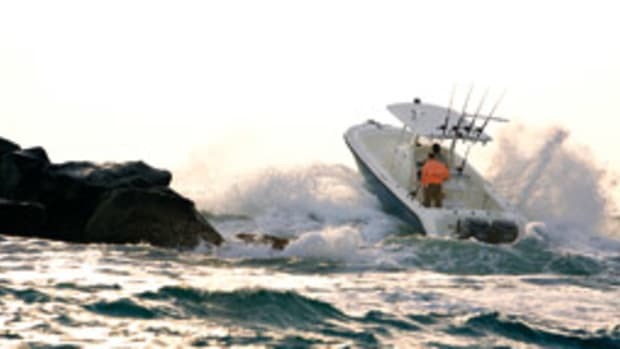 Our group consists of boats from 17 to 39 feet — two 17s, a pair of 21s, a 26, a 29, a 34 and a 39: the Mako Pro 17 Skiff CC (an inexpensive boat-motor-trailer package); the Mirage 21 Classic (a custom inboard/outboard-powered craft); the Boston Whaler 170 Dauntless (a speedy all-around boat ideal for water sports) and the 210 Montauk (the largest of this classic model); the Pursuit C260 (an example of a quality midsize center console); the Southport 29CC (a high-end, refined C. Raymond Hunt design); the Regulator 34SS (a pack-’em-in dayboat with a proven offshore design); and the SeaVee 390 Series. The boats from Mako and Boston Whaler are new. The Southport 29CC has been on the market since 2004. 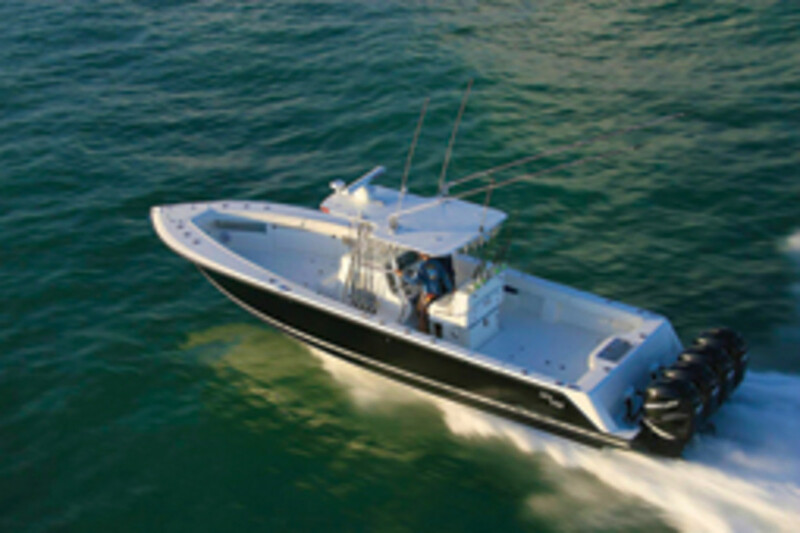 The Mako can run with as few as 30 horses; the SeaVee’s total power in its quad setup is 1,400 hp. The SeaVee tears it up at 67 mph and the 60-hp Mako scoots along at 33 mph for a top end. The consoles on our three largest boats house heads and berths. There is even a flat-screen TV option on the Regulator and SeaVee. The deep-vee dominates the hull design in this assemblage, no surprise because two well-known masters of the deep-vee — the team at Hunt Associates and Lou Codega — penned four of the eight boats. The three new small center consoles in the Mako Pro Skiff fleet captured a marine industry Innovation Award at the Miami show. Judges said the 17’s innovative hull shape delivers stability, rough-water handling and a sizable load-carrying capacity. And these boats will get you on the water for less than $15,000. Mako sees the Pro Skiff Series, which includes two 17-footers and one 16-footer, as a boat-motor-trailer package that’ll lure the fisherman from the pier or beach into a boat. The 2012 Mako Pro 16 Skiff CC is $12,395 with a 25-hp Mercury 4-stroke and trailer. The Pro 17 Skiff CC is $13,595 with a 30-hp Mercury 4-stroke and trailer. The boats come with a forward seat with an 8-gallon aerated bait well and molded-in grab handles, and a cushioned helm seat with a built-in 85-quart cooler. With a 60-hp 4-stroke, the Pro 17 Skiff CC tops out at 33 mph and gets nearly 7 miles per gallon, and at 20 mph it gets 8.9 mpg, according to Mako. The hull design — called the Advance Inverted V — contributes to the efficiency of the ride by using vents outboard of the centerline to funnel aerated water away from the propeller, Bower says. The result: The engine has cleaner water to chew through for greater speed and better tracking and handling, he says. The bow also incorporates a spray deflector for a drier ride. The 170 Dauntless joins three other larger boats in this family — the 180, 200 and 230. “The goal for the 170 Dauntless was to complement that family with an entry-level boat that runs well on a 90-hp outboard,” says Lenn Scholz, Whaler vice president of development and engineering. At wide-open throttle, the Dauntless reaches 43 mph, and if you find the engine’s sweet spot you’ll be cruising at about 27 mph with a fuel economy rating of 6.7 miles to the gallon. Even at full blast, the mileage is darn good — 4.5 mpg. 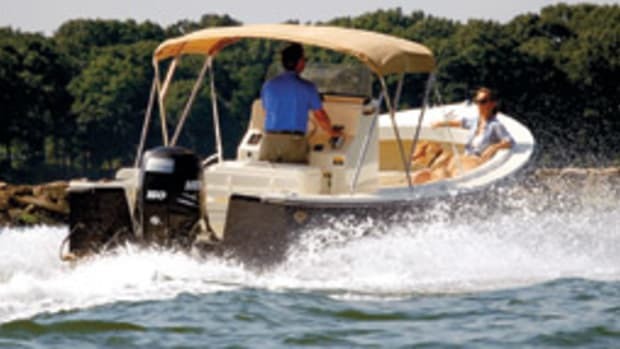 Standard aft seating, reversible helm seating, a console with room for flush-mounted electronics and a standard cooler seat with a backrest round out the standard amenities. You can add optional cushions to create a bow sun lounge. The raised foredeck design allows port and starboard sections of the sun lounge to flip up to become forward-facing backrests. Neat stuff. The hull is the same as Whaler’s side-console 17 Supersport — a water-sports platform that excels with a 90-hp outboard. The inner liner and features of the 170 Dauntless are completely different from those of the Supersport, however. 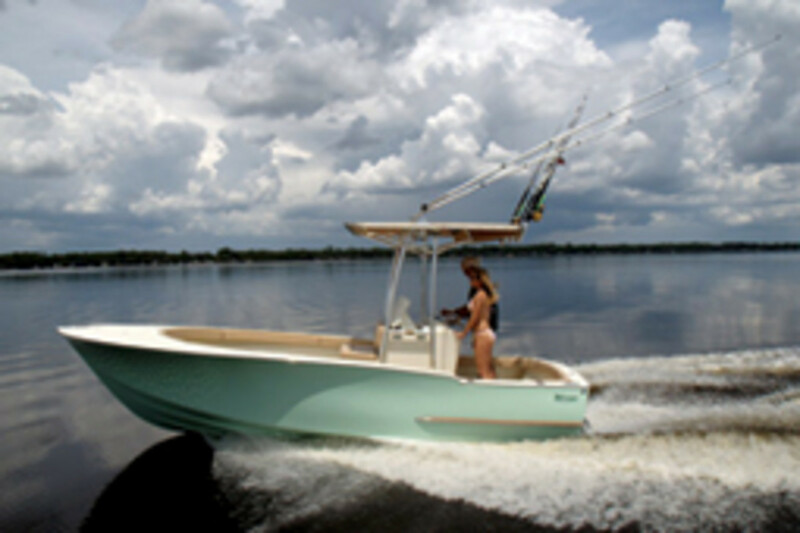 The Boston Whaler 170 Dauntless carries a retail price of $44,112 with a Mercury 90 and a galvanized trailer. The largest Montauk yet, the 210 stays true to the practical design of this legendary model. The builder also offers three other Montauks — the 150, the 170 and 190. She maintains the straight sheer of a Montauk, and Whaler builds the boat with some of the trademark safety components of a Montauk, too, such as waist-high gunwale rails and a high bow rail. It has the same type of reversible helm backrest as the 170 Dauntless but also houses a portable head in the console. Another noteworthy safety feature on the Montauk and the 170 Dauntless is the design of the swim platform and ladder. The ladder is mounted at a 45-degree angle to port so the swimmer can use the apparatus farther away from the propeller, Scholz says. The new Montauk matches up well with Mercury’s new light and efficient 150 FourStroke outboard, Scholz says. The numbers prove it. You can get 4.5 mpg at a cruise of 26 mph, and at its top speed of 43 mph she can run 3.4 miles to the gallon. This custom center console was designed for an outboard, but builder Ken Fickett, the founder of Mirage Sportfishing Boats, prefers diesel inboard-outboard power. 5 miles to the gallon. Top speed: 48 mph. The Mirage 21 Classic with I/O “goes out the door for about $59,500,” Fickett says. With a 250-hp Yamaha, the Classic’s price drops to $53,000. The Center Console is $66,000 with I/O and $53,000 with the 250-hp Yamaha. 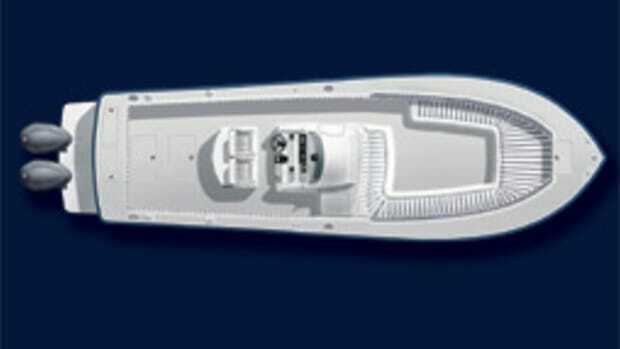 Mirage also builds four versions of a 32-foot sportfish boat. A 45-foot flybridge sportfisherman is on the drawing board. You can choose from three power options — twin 150- or 200-hp Yamahas or a single Yamaha F350. With twin 200s, the boat’s best cruising speed is 29 mph, where it can travel about 2.4 miles to the gallon. It reaches a maximum speed of 51.4 mph. With the single 350, the C 260 can achieve slightly better mileage — 2.75 mpg at 29 mph. Top speed is also 51 mph. The 29CC hit the market in 2004, designed specifically for the relatively new, heavier 4-stroke outboards gaining popularity at the time, says Ian Kopp, Kenway vice president and maritime president. “The boat is quite a bit wider than other 28- or 29-foot boats in this class, and with the C. Raymond Hunt hull design it performs exceedingly well, planing easily, handling rough water and staying dry,” Kopp says. With a beam of 10 feet, 6 inches, the boat maintains stability at trolling speed better than narrower boats, he says. The Southport 29CC was designed as a serious fishing boat, with a coffin box forward, large fishboxes aft, and fresh and saltwater washdown. Wide side decks and high gunwales add to the boat’s overall safety, Kopp says. The boat can be powered with a minimum of twin 225s, but most customers choose to hang Yamaha F300s. With this setup, the Southport gets 1.9 mpg at a cruising speed of 31.5 mph and a wide-open speed of 56.3 mph. The top speed drops to 53 mph with twin 250s and the mileage remains the same at 31 mph — about 1.9 mpg. Southport boats are now being built strictly with resin infusion technology instead of hand laying for improved strength. “There’s no additional cost to the boat for this construction,” Kopp says. The weight of the boat is critical in its design and performance, so the builder makes up for the lost weight with the switch to resin infusion by using 1-1/2 to two times the amount of fiberglass in the hull, resulting in a vastly stronger boat, Kopp says. 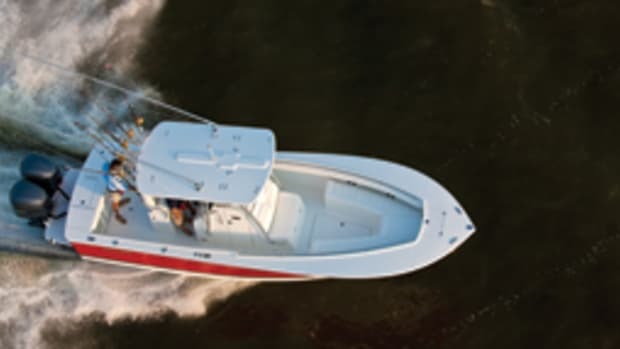 Regulator Marine’s largest center console, the 34SS, comes loaded with all the fishing equipment you’d expect from the Edenton, N.C., builder, as well as creature comforts such as wraparound seating in the bow and a full berth that extends forward in the stand-up head. The curved, frameless console windshield gives the helmsman a clear view ahead and the 34SS has the “largest cockpit in its class,” says Regulator Marine president Joan Maxwell, who is also proud of the finely finished fiberglass T-top with smooth, radiused edges. Regulator uses an Armstrong outboard bracket to move the engine mounts aft and free up cockpit space. At your disposal for fishing: a leaning post with live well, rocket-launcher rod holders, tackle storage and freshwater sink, a 272-quart fishbox and a 6-foot port-side insulated cooler box/rod storage area. The console is big enough for two 12-inch electronics displays. Inside, there’s a stand-up head with a microwave and the berth. Naval architect Lou Codega designed the 34 and all other Regulator models. 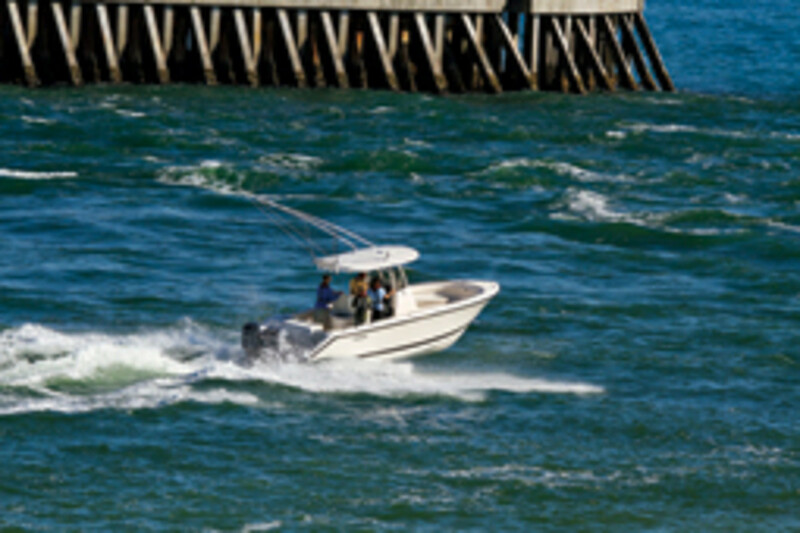 With twin 350s the boat cruises at 31 mph and gets 1.4 miles per gallon. At full blast, she pushes 60 mph. When it comes to versatility in the power department, the SeaVee 390 Series is hard to beat: outboards (twin, triple or quad), inboards or Volvo Penta’s IPS (pods with joystick helm control). 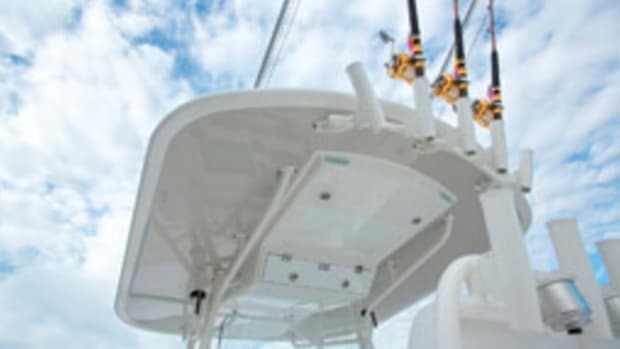 Being a semicustom builder, SeaVee could make an inboard-outboard a reality, too, if a customer wishes, says Ariel Pared, president of the Miami company. 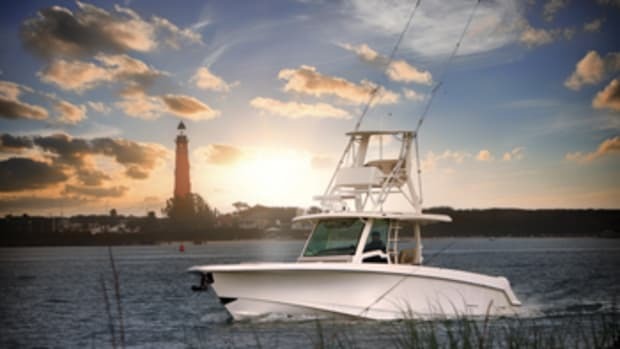 The SeaVee represents that new breed of center console that remains true to its fishing foundation, but has no shame when it comes to pampering its occupants. Case in point: the pneumatic-actuated console door, which slides on tracks to port. She’s relatively long and narrow, with an LOA of 39 feet and a beam of 11 feet. Those dimensions packaged in a deep-vee hull (designed by Ocean5 Naval Architects, www.ocean5inc.com) equate to a soft-riding offshore boat. SeaVee is known for its innovative deck features, such as the hull side door, which opens inboard and forward “so you can keep the engines in gear and land trophy fish,” Pared says.